1. Bird poop is white because birds can’t pee. Their kidneys work like ours do, but instead of producing urine, birds excrete a white paste. The paste, along with what comes out of the intestines, unites and is excreted through the bird’s cloaca, a multi-purpose hole which means sewer in Latin. And, yes, by multi-purpose, I mean they even mate through it. 2. Many dogs eat poop. This I know because, sadly, my dog used to eat his own poop on occasion. 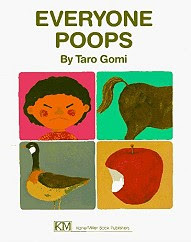 What I didn’t know was that eating poop has a name: coprophagy, and is, of course, more popular with dung beetles than dogs. If your dog eats his/her own feces, one way to discourage the behavior (other than immediately cleaning up after your dog) is to douse the poop with hot sauce or vinegar. 3. The reason why some poops float is because they have a lot of gas in them. Rather than coming out as flatulence, the gas gets stuck in the poop and forces it to the surface of the water. If there’s a lot of fat in your diet, likewise your poop might float. 4. Cavemen were better equipped to chew and digest many plants and vegetables. They had larger molars and longer digestive tracts better at handling foods rich in indigestible cellulose, like, er, corn, for instance. Evolution has worked against our ability to chew and digest corn, which is why when some kernels get swallowed whole they appear in poop. 5. The word poop comes from the Middle English word poupen or popen, which used to be the root of the word we now call a fart. Clearly poop has onomatopoeic origins.